Guide Tony Bernsen called, killed ducks and entertained us with the ease of a man who had no other notion in the world than to shoot hovering mallards trying to delicately set down in the spring-fed waters of Eagle Lakes Ranch. The brother of co-owner Mike Bernsen, he sold his share of the outfitting business years ago: "I just wanted to hunt, and not worry about a damn thing," Tony said with a smile. The hours after shooting light revealed a glorious green morning in the scablands of eastern Washington as thousands of ducks flew from the night roostâ€”many into the decoys. Our blind belonged to DU chairman Paul Bonderson, who built it in California and hauled it to this very hole to fit his style of hunting after friend and Eagle Lakes co-owner Mark Pine, another big DU supporter, revealed to him the Columbia River Basin was "one of the best places in the world to shoot greenheads." He may be right. If you want to see serious skeins of fowl, Eagle Lakes is a fabulous venue to bear witness to such a display of ducks. "I can put together all the times I have been hunting, add them up, and I don't think I have ever seen as many ducks in all of those hunts as I did today," said new buddy Frank Devlin of Otis, which makes gun cleaning products that force auto-loaders to feed shells on the coldest mornings. You can plainly see the conservation footprint of DU at Eagle Lakes, from habitat management to the overzealousness of Mike to get everyone a limit quick and get them the hell out so ducks can rest. 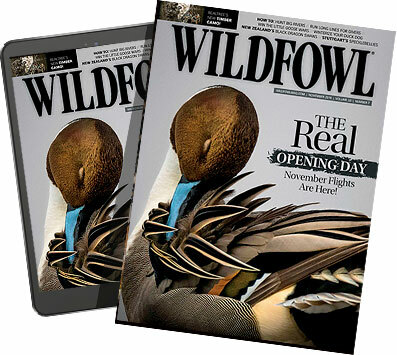 They manage the resource to keep every client happy every day of the season whether you are a corn-fed mallard fanatic or looking for a mixed bag on bigger water. Our second hunt was filled with pintail, wigeon, ringnecks, teal, a chance at redheads (we froze up as they buzzed the spread) and a final flock of five hen spoonbills we forcibly rained four birds from to finish the day. "That was awesome!" DU communications man Matt Coffey screeched after the birds went belly-up. Beyond the private ponds of Eagle Lakes, there is plenty of premium public duck hunting to be had in this beautiful piece of America created by a massive glacial flood. Thousands of years ago, enough water to fill Great Lakes Erie and Ontario broke through a giant ice dam, rushing 430 miles across eastern Washington to the Pacific Ocean, carving out deep buttes and canyons that remain today. That's why some refer to it as scabland, because the water scoured the earth, scarring it permanently. From Spokane west to the Cascade Mountains the land sprawls into high desert, filled with sagebrush and deep gorges that hold waterâ€¦and ducks. With more than 19 million acres of public land there is space for everyone, and some farmers are still apt to give access, you just have to get away from the crowds at places like Moses Lake, which is loaded with Canada geese (you can only hunt them on Wednesday, Saturday, Sunday and holidays here) with outfitters locking up cornfields in every direction adjacent to the roost. But there are many places to shoot a public duck in Washington, like the 32,000-plus acre Potholes Reservoir Unit just south of Moses Lake, and the challenging Columbia and Snake Rivers. "When it gets cold, I love to come down here and shoot divers," said Capt. Isaac Case who took us out on the Columbia for sturgeon. "And my buddies and I, we have made friends with some landowners and shoot the hell out of Canadas. A lot of honkers have no reason to ever fly any further south than the Columbia, but it's all what you make of it, just like any public huntingâ€”you have to be willing to put in the work."